Above; Jake Burton, aged 27, from Chinle, decided it was time to settle down and get a serious job, and so he turned his attention to Buxton & Leek College to make his career dreams come true, embarking on the Accounting and Finance (AAT Foundation Certificate) in 2016. 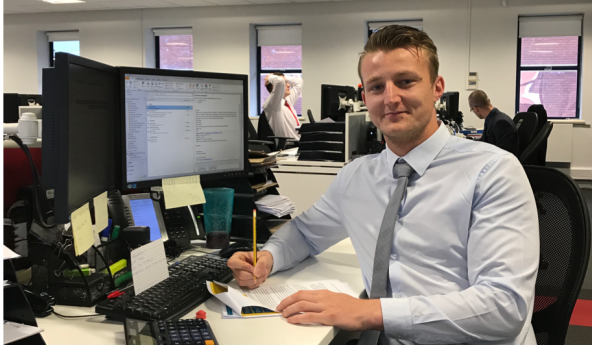 Within a year he had finished the course and has already entered the industry as an Account Assistant at recruitment specialist Senitor in Wilmslow. Want to take your first steps into a career? Or would you like to have a complete career change and study something you really enjoy? Step into your future this month with a new course at Buxton & Leek College. The college will be launching over 200 courses and apprenticeships in a variety of subjects and is still enrolling students for a September start. In some cases courses are available to start later in the autumn/ winter season. Subjects open to study include business, sport, beauty, spa therapy, engineering, health & social care and hairdressing. Education, media, performing arts, carpentry & joinery, public services, travel and art & design courses are also included in the College prospectus. Some people prefer to earn while they learn with the help of an apprenticeship. The College is open to hearing from students who are interested in one-day-a-week training positions, available as part of a full-time job with various employers in the area. Business owners are also approaching the College with an apprenticeship in mind, whether it is a family member helping in the family business or an employee that needs additional training alongside their work. To find out more about studying a course at Buxton & Leek College together with information on fees call them now on 0800 074 0099 or visit https://www.blc.ac.uk/subject-areas/ and look through the various courses available.